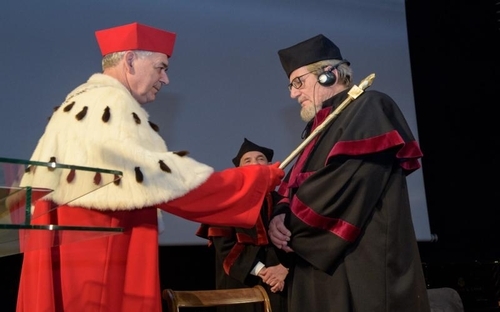 Oskar Gottlieb Blarr – Professor at the Robert Schumann Hochschule, the German cantor, conductor and an animator of music life, received an honorary doctorate of the University of Warmia and Mazury. The Senate of the UWM conferred this honour to Prof. Barr for his activities to save cultural heritage, especially old musical artefacts and pieces of music in Warmia and Mazury, for popularising the music of Feliks Nowowiejski and for organising musical life and his activities aimed at bringing the German and Polish nations together. In his speech after he received the nomination act, Prof Oscar Barr expressed thanks to all those who supported him in his cooperation with Poles. Subsequently, the Professor delivered a lecture entitled The organ and the Germano-Slavic community of fate. In it, he presented how he had accomplished the mission described in the title. He did it by meeting people who inspired him to engage in various activities. ‘Why should we restore, repair, build bridges, seek reconciliation and things that are common to us?’, asked the Professor at the end of his lecture. ‘Because true art often goes before politics and can make it more human’, said the honorary doctor. The ceremony of granting the honorary doctorate took place on 14 October at the Olsztyn Philharmonic. It was accompanied by a concert performed by Prof. Barr’s ensemble, a concert by the Pro Musica Antiqua ensemble and an exhibition of graphic works by Zbigniew Urbalewicz of the Faculty of Fine Arts at the UWM, inspired by pieces of music composed by Oskar Blarr. Oskar Gottlieb Blarr was born on 6 May 1934 in Sędławki, in the commune of Bartoszyce in what was then East Prussia. He studied music and percussion. After graduating, he took up the position of the cantor and organist at Neanderkirche in Düsseldorf, which he occupied until he retired in 1999. At the same time he worked at the Robert Schumann Hochschule in Düsseldorf. Oskar Blarr is an organiser of festivals and other music events, as well as a populariser of the music of Feliks Nowowiejski in Germany. He composes religious, vocal, vocal-instrumental and instrumental music (including pieces for organ). His artistic work is connected with East Prussia. He has collaborated with the choir of Collegium Musicum and with the Museum of Warmia and Mazury in Olsztyn. He has given a number of concerts in Olsztyn and in other towns in the voivodship. He has performed word and music programmes with texts written by regional artists, such as Johannes Bobrowski and Erwin Kruk. He has been making consistent efforts to save organs in churches in Bartoszyce, Pasym, Barczewo, Węgorzewo, Pasłęk and recently in Kwidzyn.